As the summer months approach thousands will be heading off to music festivals all over the world, but if your passion isn’t music, there are plenty of other weird and wonderful festivals to attend worldwide. Burning Man Festival, USA – once a year, tens of thousands of people gather in Nevada’s Black Rock Desert to create a temporary metropolis dedicated to community, art, self-expression, and self-reliance. Day of the Dead, Mexico – this festival originated in Mexico but is now celebrated all over the world, and centres on remembrance of families and friends who have died. People dress up as skeletons and celebrate the lives of their loved ones with music and food. Holi Festival, India – also known as the festival of colour, Holi is a Hindu festival celebrated in India and Nepal to commemorate the victory of good over evil and the end of winter. Celebrations include throwing coloured powder and water whilst dancing in the streets. La Tomatina Festival, Spain – basically the world’s biggest food fight, people travel from all over the world to throw more than one hundred tons of over-ripe tomatoes at each other in the streets of Bunol, Spain. 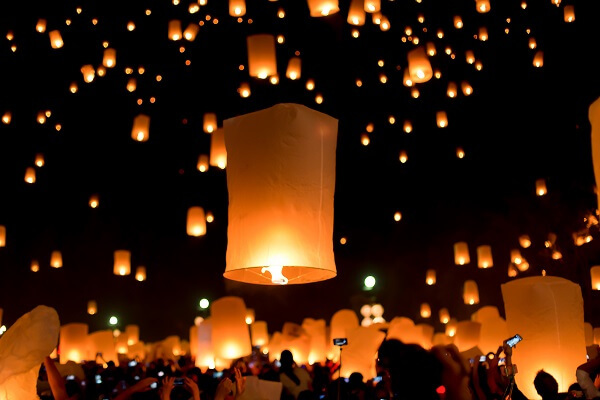 Yi Peng Lantern Festival, Thailand – known as the festival of lights, the visually stunning Yi Peng Lantern Festival is held all over Thailand and involves releasing lit lotus-shaped receptacles into the air to bring luck and fulfil wishes. If you’re planning an adventure abroad, just remember to invest in quality travel insurance before you leave home. Without travel insurance you could face expensive bills if you face an unexpected holiday disaster, such as cancellation, medical emergencies or lost possessions. Visit Holidaysafe.co.uk for more information on adventure travel insurance.